Do you love Harvard’s waterways, conservation lands, orchards, trails, parks, and open spaces? Do you support sustainability in town/school policies and practice? Come to the Bromfield School library Wednesday, May 31, at 7 PM. to hear from local committees, groups, residents, and students working to protect and sustain Harvard, and join in discussion on what we can achieve together! 200 Redbud seedlings wrapped and ready to go . . . 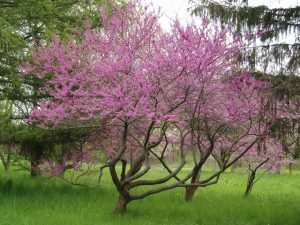 The Harvard Conservation Trust will distribute Eastern Redbud seedlings at the Transfer Station on Saturday, May 6th from 8 AM to noon, and on the Harvard Common on Sunday, May 7th from 9:30 AM to noon. In early spring, their pink-purple flowers line the bark of their twigs, branches, and trunks, announcing the end of winter. Redbud has uniquely heart-shaped leaves. 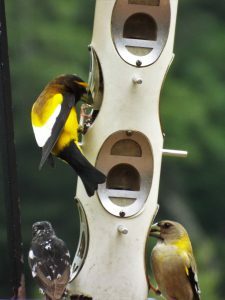 Many birds eat the seeds, and honeybees visit the blossoms. The shrubs are free to Harvard Conservation Trust members and are available to non-members for a $5.00 contribution. These, too, are the sounds of nature . . .
Did you know that the “sounds of nature” are not necessarily pleasant, nor is the music that imitates them? Join local musician Stephen Peisch and David Pihl as they present a program of piano music that was inspired by nature, including compositions by Robert Schumann, Franz Liszt, Bela Bartok, Amy Beach, Edward MacDowell, Sergei Rachmaninoff, Allen Hovhaness, Claude Debussy, Stephen Peisch, and William Thomas McKinley. David Pihl, pianist, of Worcester, Massachusetts, studied at Boston University School of Music and received his Master of Music in Piano Performance at the University of Lowell School of Music. His principal teachers have been Michael Kramer and Anthony di Bonaventura. He also studied vocal accompaniment in Europe under Ellly Ameling and Rudolf Jansen. He has performed widely in the Northeast, and, together with Michael Finegold, co-founded the Essex Chamber Music Players. David Pihl has taught music at Worcester State College, Northern Essex Community College and Becker Junior College. He is the staff accompanist for the Theatre Dept at Holy Cross College and has been the accompanist for the University of Massachusetts – Lowell Chorus and Westford Chorus. Volunteers Hall, Harvard Public Library. Free! No reservations or tickets required. 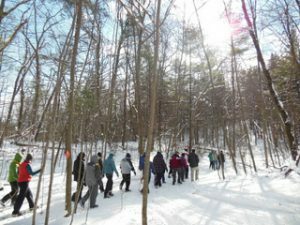 Per tradition, HCT likes to ring in the New Year with a stroll among Harvard’s forests and fields. Nothing sets the tone for the year ahead like a leisurely walk with friends and neighbors in the crisp rejuvenating air of January. This year, in the spirit of cooperation and good company, we will join the walk being held at the Oxbow National Wildlife Refuge by the Friends of the Oxbow in collaboration with the Lancaster Community Center. 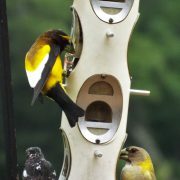 Meet at the parking lot of the main entrance to the refuge at the end of Still River Depot Road in Harvard; the walk starts at noon. Dress weather appropriate; in the event of hazardous weather, the walk will be cancelled. For more information about the walk contact Rona Balco at: 978-779-2259; for location and directions visit: http://www.friendsoftheoxbownwr.org/location-directions.html. 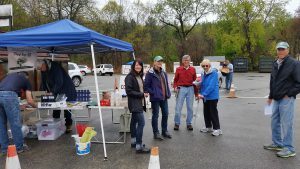 HORSE MEADOWS KNOLL VOTE – CORRECTION! 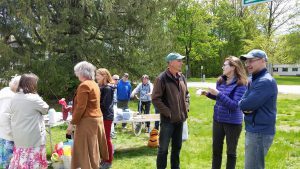 Thanks again to those who came out for the Horse Meadows Knoll walk yesterday. Please note the correct time and location below for tonight’s Special Town Meeting, which will include a vote to acquire Horse Meadows Knoll as conservation land. Super Town Meeting starts at 7:00, which will then go right into Special Town Meeting. BOTH take place in Cronin Auditorium at the Bromfield School, 14 Massachusetts Ave. The Super Town Meeting could conclude early, and with Horse Meadows Knoll being Article 1 on the Special Town Meeting Warrant, this vote might happen before 7:30. 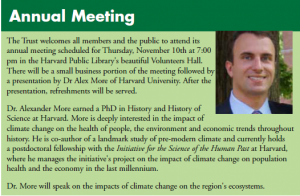 Please consider arriving by 7:00.
https://harvardconservationtrust.org//wp-content/uploads/2016/08/HCT-Color-Logo.png 0 0 Julie Weigley https://harvardconservationtrust.org//wp-content/uploads/2016/08/HCT-Color-Logo.png Julie Weigley2017-07-08 18:08:202017-11-15 19:30:43HORSE MEADOWS KNOLL VOTE - CORRECTION! Mushroom Walk – 56 Stow Road. HCT will host a mushroom walk Saturday, October 1, beginning at 11 AM at 56 Stow Road. Join mushroom enthusiast Al Ferry for a walk in the woods to learn about Harvard’s fabulous fungi. The walk will take place rain or shine, except for a major downpour. Parking is available. For more information call Abbe at 978-456-6892.